In 1910, as you can read on Wikipedia, the Roberts' (a father and son team in Örebro) developed a new soft drink. It was flavoured with barley and hops, was sweet and coloured with caramel. 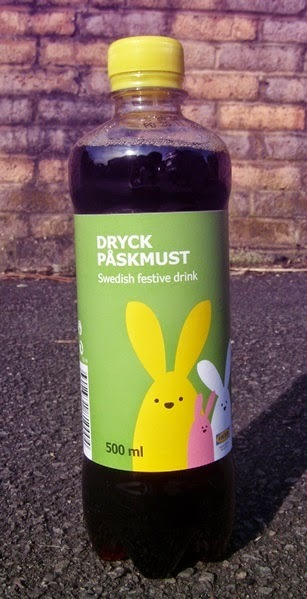 They marketed it as a festive non-alcoholic alternative to beer. At some stage people began to sell it at Easter, too. 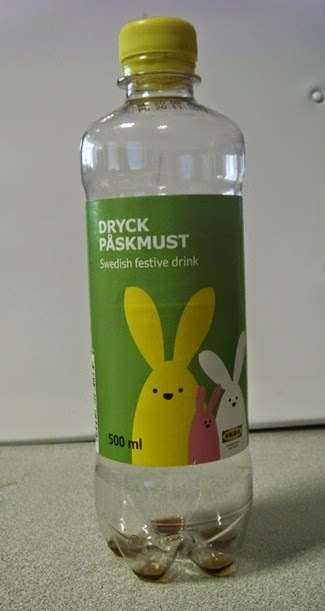 Påskmust ("Påsk" = Easter) is exactly the same drink as Julmust, just with a different seasonal-themed label and a different name. The base syrup is still made by Roberts AB; this is supplied to other drinks manufacturers to make up into drinks. Remarkably, Julmust remains as popular as ever in Sweden, outselling Coke during the festive period. If "sitting is the new smoking" (as I heard on TV a couple of days ago), then soft drinks are the new alcohol, that is, they're increasingly regarded as a menace to public health and associated with the most messed-up echelons of society. The time may yet come when drinking Julmust or Påskmust is seen, not as a badge of virtue, but as a thrillingly naughty bit of licensed misrule. Actually, there might be something in this. Marketing sticky drinks and fast food as seasonal might be quite a civilized way of breaking the habits that form obesity and diabetes while still licensing us to enjoy the occasional guilt-free blowout on cheeseburgers and Fanta. On the theory that the biggest risks to a person's health are what they do every day. The magic of mass production: you can get it more than once.